A little while ago I mentioned that I was going to play a game against my friend Josh’s Tau with some Inquisition madness. Well, we played, and I lost, and I thought I’d talk a bit about the game. I had a bad cold and Josh only had three hours sleep, so the report will be quick and fuzzy. This was the first time in ages I’ve used Inquisition forces in a battle. As usual they were extremely hit-and-miss. Mostly miss. I was using Witch Hunters as allies for my Guard, and I went with an Inquisitor Lord with three plasma warriors and Divine Pronouncement, and an Eversor assassin. Josh also let me swap out my Rough Riders at the last minute for an Orbital Strike. I thought this was a good idea as the cavalry have never made a good show against the Tau, but as it turned out the lance strike wasn’t much of an improvement. I would have been better off playing with the horsies. Lucienne Izumi looked up as the whitewood door slid open, revealing her old sage and advisor. Orgone Accumulator stood tall and thin in the doorway, dressed in his usual musty dark robes. “But milady, surely we have more pressing matters. The Heaven’s Gift are beginning to delve too deeply into Malavar’s Grimoire. Surely others can handle this development, we are Hereticus, and – ” Lucienne silenced him with a look. Her sage, while valuable, always did speak a little too freely. She flexed the fingers of her bionic hand, lazily watching the light reflecting off the polished blue-steel. 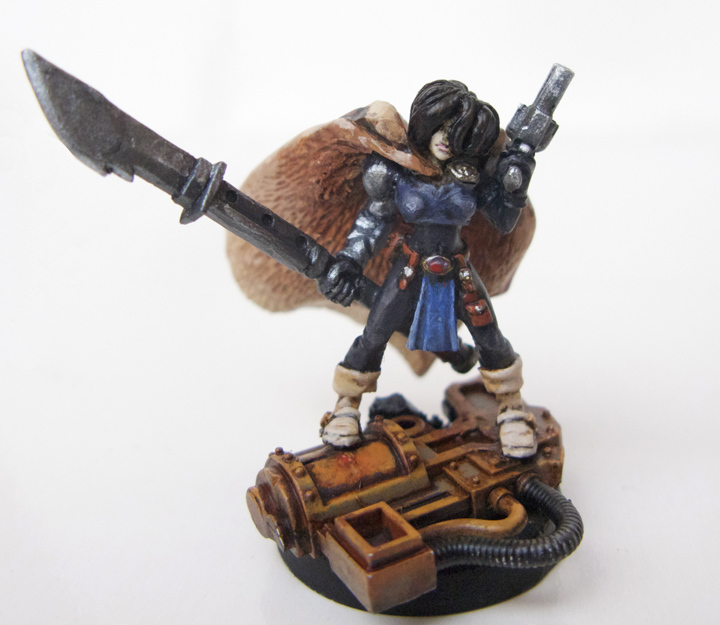 So, I finished my new Alita-inspired Inquisitor after a bit of a drama – I managed to drop her on my concrete porch just before I undercoated her, and her arm and coat smashed off. Pretty annoying. Still, all’s well that ends well as my Gran used to say. I try to experiment with new techniques whenever I paint characters, partly to increase my skill but mostly just for fun. With Izumi I tried to get a lycra pants effect by starting with super-thin coats of pale blue-grey and then adding shadows outwards in darker and darker layers. It looks OK but I probably could have got the same effect more easily some other way. I used different base colours for the bionics (blue), glaive (dark grey) and six-shooter (pale grey), to try to give the impression of different grades of steel, but it turned out more subtle than I hoped for. I got some metal medium and I’ve been highlighting with that, it’s awesome. 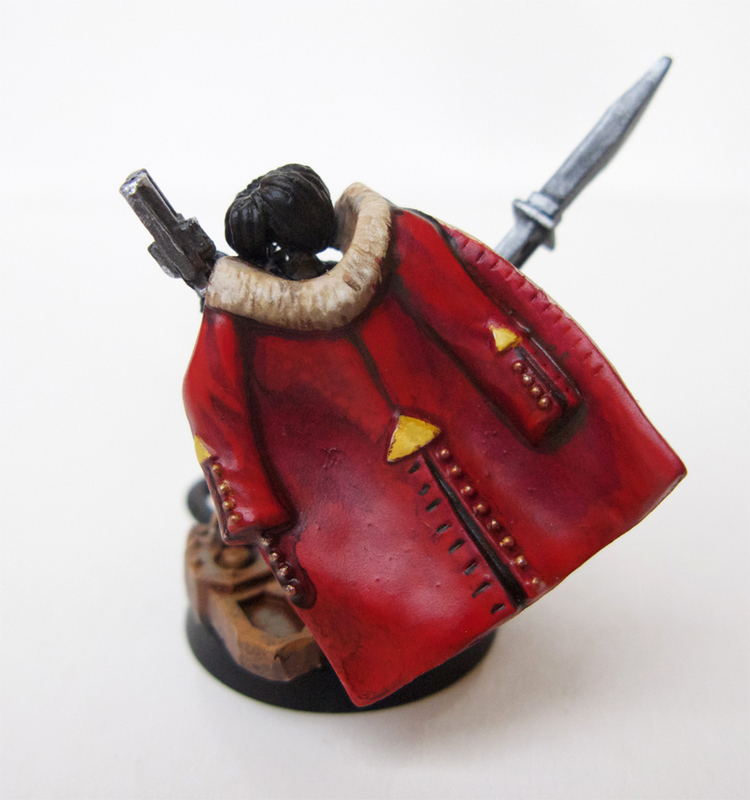 I aimed for a shiny red-leather effect on the coat by highlighting with dapple brush-strokes. The fur lining was meant to look like fox-fur, but I didn’t get the colour quite orange enough. I’m pleased with the result though, it frames the dark model well I think. I need to stop taking such close-up pictures – my painting style looks pretty decent to the naked eye but doesn’t hold up well under magnification! Izumi will be christened soon. 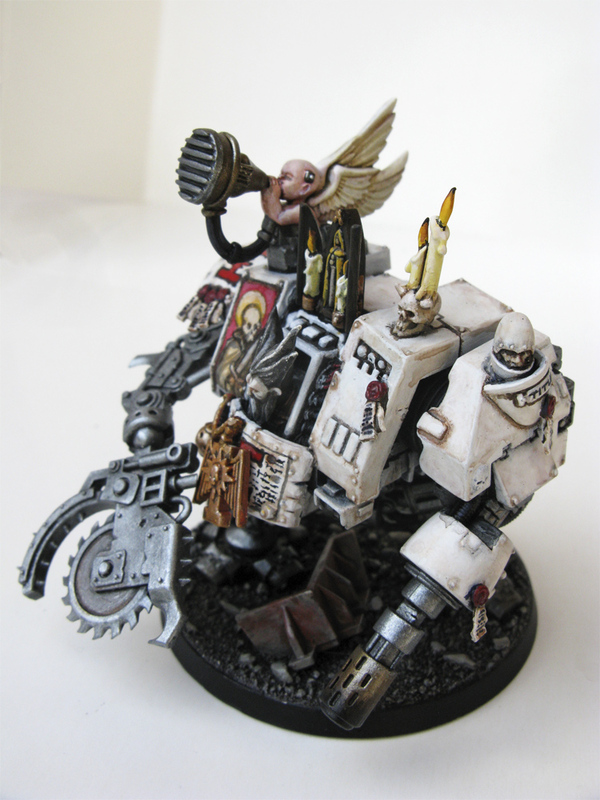 I’ll be playing a game against my mate Josh’s Tau, and I told him I’d use an Inquisitor because he’s never faced one. Let’s hope she does me proud. 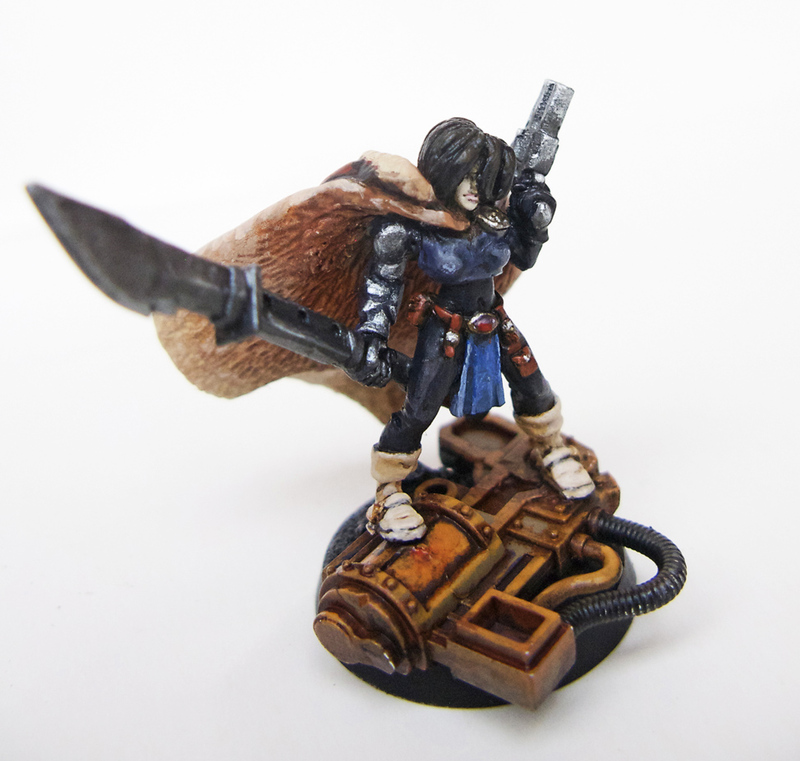 Today I’m going to show the process for my latest Witch Hunters Inquisitor. I’ve made a few of these guys since Codex: Witch Hunters came out in 2004. I find Inquisitors really fun to model, to the point where I have way too many of them (of uh . . . varying quality). 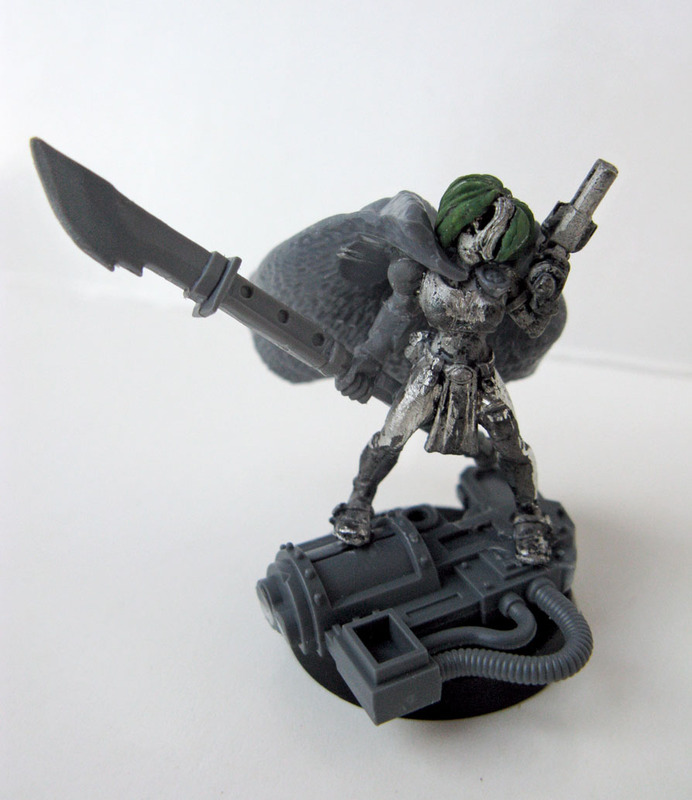 Years ago I grabbed an Escher juve from GW’s Necromunda line to convert into a Callidus Assassin, but I was never happy with her. She seemed a bit too cute and little to be a psychotic bio-engineered shapeshifting killer. It’s a pretty good model though, and probably one of the only models GW has ever made that I could actually call “cute” come to think of it! So, I stripped her down and I’m going to convert her a bit to make another Inquisitor. Yes, I like manga and anime, but because I am in my thirties I only like the best. And by the best, I mean the stuff from when I was young of course! I don’t know, all you whippersnappers today with your spiky-haired death-god ninja school kids with two-foot wide swords . . . But I digress. 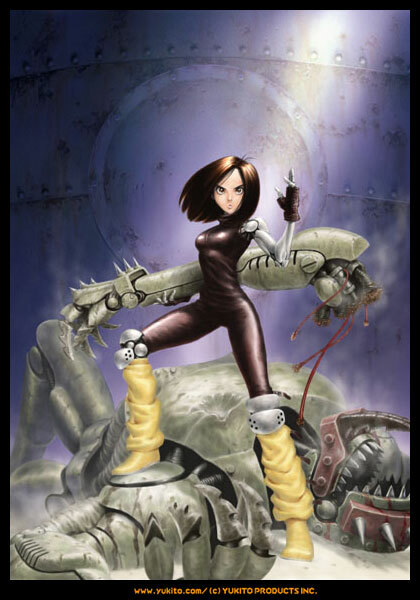 Since Alita is my inspiration, I’m going to give Lucienne a bionic arm with a combat glaive. She already has a revolver like Alita’s, but she needs a coat to flap dramatically around her bodysuit. Nearly ready for an undercoat. Just a little more greenstuff on the interior of the coat. The arm is an eldar one, shaved down with a knife and sandpaper. I think it’s a Dire Avenger Exarch sword arm. The coat is from the Empire pistolier kit, a good one to have if you’re going for a steampunk feel (which I usually am). For the glaive I used parts from a kroot rifle, a leman russ heavy stubber rack, and an ork choppa. The base detail is a hacked-up killa kan skorcha arm left over from building Julius Borgez. I think it gives the model a nice cyberpunk touch in keeping with my inspiration. She has a bit of an old-school 40k look, rather than grimdark gothic and dripping with purity seals and skulls. I’ve learned with Inquisitors that since they have such a wide variety of wacky wargear to choose from, the best thing to do is to give them some kind of impressive melee weapon and an ambiguous pistol. That way you can mix it up with power weapons, force weapons, close combat weapons, bolt pistols, laspistols, plasma pistols, inferno pistols, whatever you feel like smiting the heretics with today. Lucienne’s polearm could even be a power stake. Hmmm. I could be one of the first people in history to actually field a power stake on the gaming table . . .
Julius Borgez is a popular crusader and witch hunter, celebrated across many worlds on the Eastern Fringe. Unlike many of his fellows, Borgez has always openly practiced his profession, eschewing subtlety and espionage in favour of brutal pogroms and public persecutions. He is a hardline Monodominant Inquisitor, believing (with some justification) that compromise leads inexorably to corruption. Utterly dedicated to the preservation of humanity in the face of its many enemies, Borgez has sacrificed his own body in the battle against the heretic and the witch. At the age of two hundred and sixty he lost all of his limbs in a skirmish with a heretic coven on the forge world of Grendel’s Dawn. Borgez faced and slew the horrifying many-armed mutant witch Skaya the Underhanded but was crippled in the process. The tech-priests of Grendel’s Dawn rewarded Borgez for his heroism with the Armour of St. Halifax, a towering battle suit into which he could be implanted in times of need. When duty calls Borgez removes his humble steel bionic limbs and becomes a walking giant of retribution. Accompanied by his hard-wired gun servitor Titus, an associate of many decades, the fearsome Inquisitor leads from the front, preferring to fight beside waves of troops who can be inspired by his impressive stature and heroic reputation. When devils and heretics see the wild bearded face of Julius Borgez snarling at them from within the mighty cyborg then truly they know the fury of the righteous. This unstable looking fellow is my counts-as Inquisitor Lord Fyodor Karamazov from Codex: Witch Hunters. The original Karamazov model is awesome but I baulk at paying $85 for him, and metal is a pain with big guys like that anyway so I decided to make my own. He’s built mainly from an astartes dreadnought with a few bits from the immolator kit, an ork killa kan’s arm, and a bunch of other stuff I had lying around. I plan to use him as an ally to my Imperial Guard, but one day the pure Witch Hunters will come out to play. I just need to paint the rest of those sisters that have been sitting there for a year. And convert some arco-flagellants. And some death cult assassins. My Witch Hunters suffer from a severe case of too many chiefs and not enough Indians. If I could field nothing but HQs they’d be in business. . .
Borgez took ages to paint because I ran out of steam a bit after the white armour and finished him off over a week or so. He’s a pretty good example of my painting style – quick and lazy! I try to build up layers of inks, washes and drybrushing rather than use careful blending and edge highlights. I guess I could be neater, but I prefer a loose and textured look to precise and clean. Plus like I said . . . lazy. I also hear on the grapevine that Karamazov may be in the new Grey Knights book, which would mean he can no longer ally with Imperial Guard. 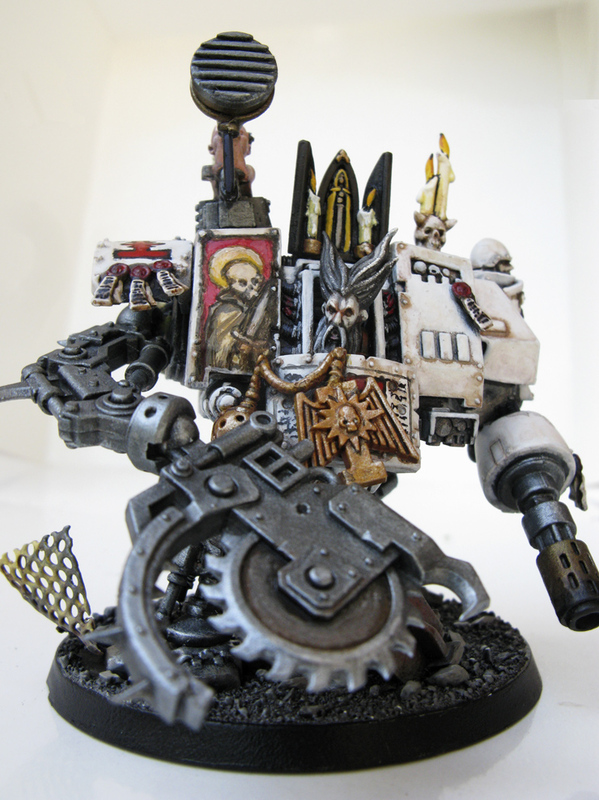 Typical – every time you build a religious maniac cyborg killing machine for your army they go and disallow him.